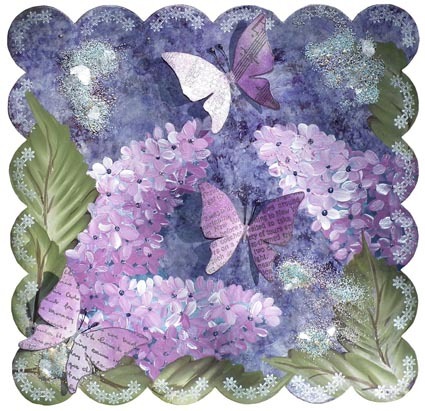 This Decor Plate﻿ features Sheena Douglass's Lilac Paint Fusion stamp set and my new Butterflies. The background was made with alcohol inks with the new white as the top layer. The leaves and lilac were painted as per Sheena's instructions in the stamp set. The butterflies were stamped over blotting paper which had been coloured with Luminarte Radiant Rain Mists. The antennae are artificial flower stamens glued between the Decor Plate and the butterfly body. The border was stamped with one of my Edger designs. I am entering this in the Craft a Scene Challenge. Very pretty! And Lilacs are my favorite! Wow, Caroline, this is beautiful. Good luck and thanks for joining in on the fun at Craft a Scene challenge blog. Acetate, Glitter Spray and me!